"This is the new digitally remastered 2015 expanded edition of Soul Jazz Records’ biggest ever selling release, ‘100% Dynamite! Ska, Soul, Rocksteady & Funk In Jamaica’. Since the album’s original release nearly twenty years ago, ‘100% Dynamite’ has become a cornerstone of reggae: eighteen killer tracks that show the influence that American Jazz, Funk and Soul music had on Jamaican Reggae. The proximity of the West Indies to the USA meant that many Jamaican musicians were influenced by American styles of music whilst at the same time defining new styles of their own such as Ska, Rocksteady and Dub. 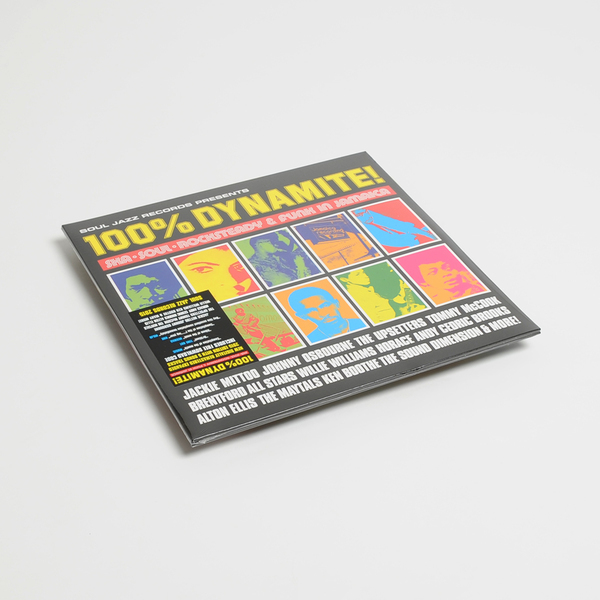 ‘100% Dynamite’ features some serious Jamaican funk by Jackie Mittoo, The Upsetters and Toots & The Maytals, the cream of Jamaica's jazz musicians such as Tommy McCook, Cedric Brooks and Lennie Hibbert. Also included here are heavyweight Reggae versions to Soul classics by Marlena Shaw’s ‘Woman Of The Ghetto’, Aretha Franklin’s ‘Rocksteady’, Syl Johnson’s ‘Is It Because I’m Black’, William DeVaughan’s seminal ‘Be Thankful’ and more. 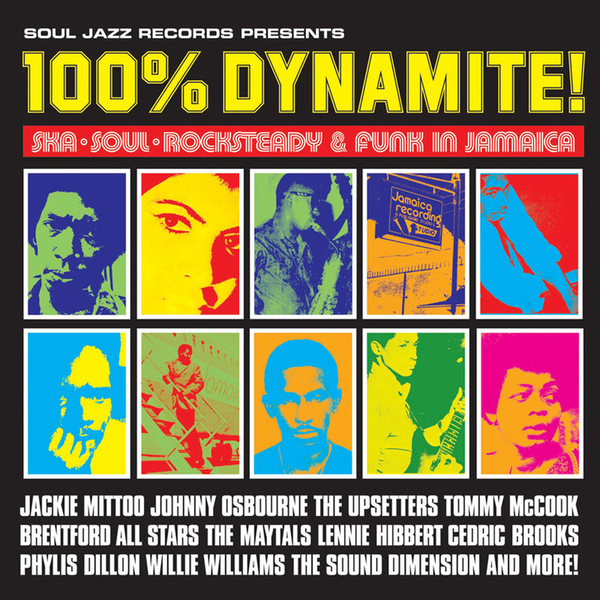 ‘100% Dynamite’ also features revolutionary tunes such as Johnny Osbourne’s ‘We Need Love’, Sound Dimension’s ‘Drum Song’ and Lloyd Robinson’s ‘Cuss Cuss’, songs that helped define a unique sound for Jamaican music in the Sixties and Seventies. These influences went both ways - check Brentford All Stars’ massive ‘Greedy G’, the basis for Boogie Down Productions’ ‘Jack of Spades’, or Willie Williams’ ‘Armageddon Time’, later covered by The Clash. This new expanded edition features seminal tracks from the greatest Jamaican producers - Clement Dodd, Lee Perry, Winston Riley (Techniques) and many more." Remastered 2015 edition with 5 bonus tracks. Includes free download code redeemable form the label.